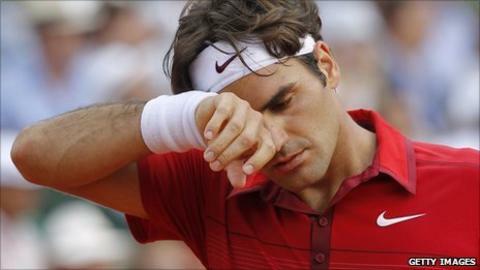 Roger Federer has withdrawn from a Wimbledon warm-up tournament in Halle, Germany to rest his sore groin. The world number three, who lost to Rafael Nadal in the final of the French Open on Sunday, pulled out of the Gerry Weber Open grasscourt event on Monday. "After talking with my team this morning, I feel that it is too big a risk to take a chance and aggravate it before Wimbledon," said Federer. Wimbledon, which the Swiss player has won six times, starts on 20 June. Federer added of his decision to withdraw from the event in Germany: "I am very disappointed as it's one of my absolute favourite tournaments on the ATP Tour, but my body, especially my groin, really needs a rest." The 29-year-old has won at Halle five times but his late withdrawal has angered organisers. "I am stunned," said tournament director Ralf Weber said. "Our plans for the past year have been nearly exclusively with Roger appearing. "He never gave us any doubts that he had health problems. I clearly expressed my disappointment to his management." Top seed Federer had been due to meet Australian Lleyton Hewitt in the first round in Halle. But after losing to Nadal in four sets in Paris as the Spaniard won the event for a record-equalling sixth time, Federer has opted to regroup ahead of Wimbledon. World number two Novak Djokovic pulled out of another pre-Wimbledon event - the Aegon Championships at Queen's Club - following his semi-final exit to Federer at the French Open. Djokovic, 24, cited patellar tendonitis - a problem with his kneecap - as the cause of his withdrawal. But Andy Murray has recovered from the ankle injury he sustained in Paris and will play at the Aegon Championships as he completes his preparations for Wimbledon.